In historic Carlisle PA, Donna Hurley is a piecemaker....that is quilter. 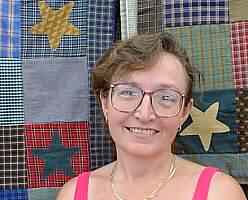 Donna has been quilting for 14 years, and teaches quilting classes in 3 different shops. She has been making appliqued and fabric crafts full-time for three years. Acknowledging the fact that she is a fabri-holic, Donna uses her great sense of color to piece and sew accents for your country home. Click images to see a larger picture. 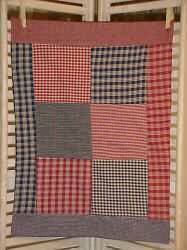 In an assortment of homespun country plaids, Donna Hurley has made varying sizes of table runners accented with stars. You may choose from approximately 12" x 12" for $8.00 up to 17" x 60" for $42.00. Shown is approximately 16 1/2" x 46", and the cost is $27.00 plus $2.50 shipping and handling. 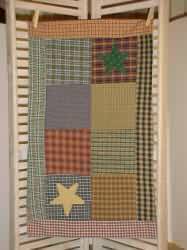 The pillow is made with many different colors to make a Scrappy Star available 12" for $14.50 or 14" for $16.50 plus $4.00 S&H. 3 Block Scrappy Home Spun Runner w/out stairs. Approx. 16" x 22" - $13.00. Also available in many sizes & colors. Plus S&H $2.50. 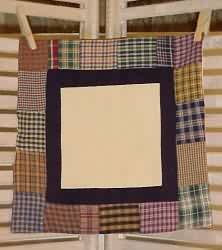 A Scrappy Bordered Table Cover 10" is $11.00 also available 22" for $24.00. These are great for the center of a table. Plus S&H $2.50. 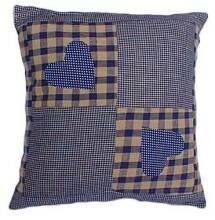 Scrappy & Colored 12 & 14" pillows. $14.50 & $16.50. Plus S&H $4.00.